For a long time I casually played the pokies without realizing the extent to which they’re ripping the soul out of the nation’s capital. In financial year 2014/2015, Canberrans lost over $167 million on poker machines. We fed over $2 billion into pokies, that’s almost twice as much as the ACT Government spent on Education in 2015/16. 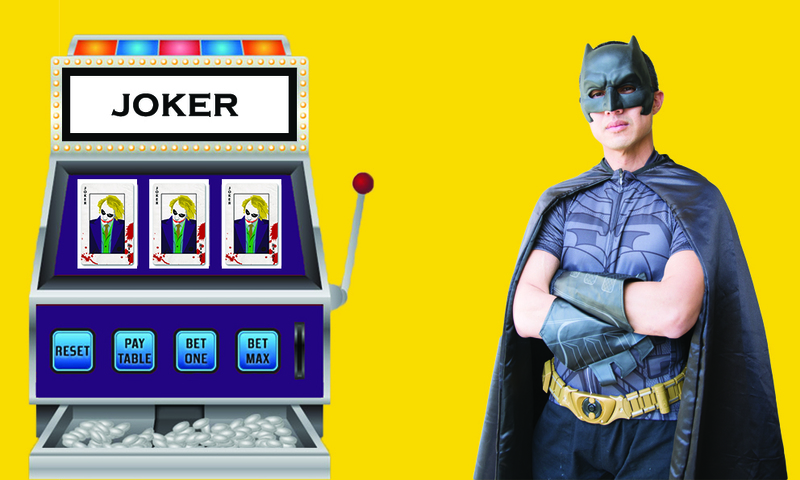 It’s estimated that 28 per cent of that income came from problem gambling. Pokies are responsible for 75-80% of problem gambling, which is directly related to a series of other social ills. So if you’re concerned about crime, mental health, poverty and families, then you should also be deeply concerned about poker machines. Polls suggest that 80% of Australians support poker machine reform. Most of us recognize that they magnify misery and inequality and take far more from the community than they give. Rather than cooperate to address this persistent problem, poker machine advocates put forward three arguments for doing nothing. Of the tens of thousands of people who play poker machines regularly in the ACT, only a small fraction have a gambling problem. The majority of players should not be penalized because of an irresponsible minority. The first response to this argument is that the ACT Gambling and Racing Commission advocate a public health approach to gambling harms, whereby addicts are not viewed as lacking character, but rather suffering from an illness that’s caused by a mix of social and personal factors. The second response to this argument goes to the actual figures. The ANU’s Centre for Gambling Research found that approximately 4,700 Canberrans have a significant or severe gambling problem, 75% of whom play poker machines. On average 1 out of 6 players at any point in time are problem gamblers. It’s also well known that gambling harms are not isolated. Seven to ten people are affected by each case of problem gambling. Family members commonly report not only the loss of income, but also the associated deterioration of relationships through stress, lies, anger, theft and violence. ACT clubs contribute $11 million to sporting and community activities. When our clubs suffer, so too do many of our teams and events. Clubs also contribute intangible benefits to the community. They embody our culture and history and provide a space for people to get together and recreate. The question however is, ‘Are you comfortable knowing that a significant proportion of that sponsorship and service is derived from addiction and misery?’ If the answer is ‘no’ then we should look for healthier forms of funding. Moreover, if we offset those forms of income against the broader costs of gambling-related harms, poker machine reform makes not only moral sense, but also good socio-economic sense. While online gambling is rising, it remains a very small proportion of overall gaming spending. It’s impossible to address problem gambling without addressing the largest method of gaming in the ACT: poker machines in clubs. There’s also very little evidence that even well-trained staff and attentive friends can effectively intervene to confront or stop addicted gamblers. Drawing upon recent research from the ANU Centre for Gambling Research, there are three important points to recognize when it comes to reducing new incidences of problem gambling and tackling existing ones. Firstly, there’s no silver bullet. This issue has to be addressed on multiple fronts and in a coordinated manner. No such strategy exists right now in the ACT. Secondly, effective research, monitoring and scrutiny of poker machine reform is vital. Thirdly, solutions have to be customized to local areas while also aligning with a national program of action. The ACT can take the lead in terms of poker machine reform because there are only around 59 venues rather than the thousands in NSW. Pokies reform needs to be undertaken with and not against clubs. Some clubs have made moves to provide additional support services to mitigate problem gambling and the oldest club in Canberra, The Burns Club, has been proactive in moving away from relying on poker machine losses for income. The government needs to support such clubs by providing them with rates reductions and rebates. Moreover, a poker machine reduction fund should be established to help venues transition away from poker machine income. In addition, we in the community should vote with our feet and wallets and frequent venues that, with good faith and effect, strive to eliminate gambling harms. This will reinforce the message that gambling addiction is a public health issue that we all need to confront. With club support, I propose three levels of possible action that should be undertaken across the board, regardless of whether the venue is a club or casino, and independent of its size or political affiliations. Firstly, harm minimization measures such as limits on maximum bets and losses, and an effective self-exclusion system as well as more funding for treatment services. Secondly, pre-commitment and opt in measures. Finally, radical reductions in poker machine numbers and a phased outright ban. Hopefully, only the first level will be necessary to address problem gambling, which is why monitoring and research is so important. However, the scope and persistence of the problem means that we must discuss and consider all measures from the outset. It’s also important that we promote measures that not only minimize harm, but also offer attractive and compelling pathways to eradicate and prevent problem gambling. To what extent is problem gambling a personal or social issue? Do poker machines deserve particular attention when it comes to addressing problem gambling? What, if anything, should be done about problem gambling? Stay tuned for a follow up article with more details on possible solutions. Two thumbs up. Go you good thing. You forgot the most important question: Where does the money go? Kim, as an independent, you are in a unique position to take a stand on an issue and be neither beholden to a party’s point of view, or accused of political motivation. I realise you may want to retain objectivity, but sometimes the objective facts will tend to make one side look worse than the other. I’m surprised that in an article of this length and detail you didn’t discuss the real addiction that is in play.